Rahman won hearts in the national capital at the Indira Gandhi Sports Complex by regaling his fans with all his hit numbers at the A.R. Rahman ENCORE - The Concert in association with MTV'. 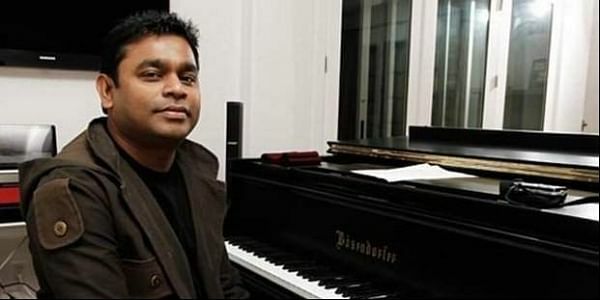 NEW DELHI: Music maestro and Oscar-winning musician A.R. Rahman marked his 25th anniversary in the entertainment industry by setting the stage on fire with his high octane tracks including the classic number "Muqabla" here at his Encore concert on Saturday. Ahead of Christmas on December 25, he even played a Christmas medley on the piano. His concert here was a part of his four city tour in India, which had taken him to Hyderabad, Ahmedabad and Mumbai. The three-hour-long concert also had singers like Ranjit Barot, Neeti Mohan, Jonita Gandhi, Mohit Chauhan, Javed Ali, Shaashaa Tirupati, Hriday Gattani, and Harshdeep Kaur. Rahman regaled the jam-packed stadium with all his hits including "Naadaan Parindey" followed by a light hearted conversation with the audience paying tribute to his motherland which beautifully set the tone for his next track "Yeh Jo Des Hai Tera". Other songs he played included "Chaiyya chaiyya", "Mustafa mustafa", "O humdum suniyo re", "Tu hi re", "Tere bina", "Jana gana mana", "eJo bhi main", "Tum tak", "Jiya je", "Urvashi" and "Humma". "Matargashti" and "Masakali", which saw bobbleheads. synced into the choreography amid a display of LED concoctions. The unplugged version of "Dil se re" and rock version of "Patakha huddi" saw Rahman in a jovial form fusing different instruments together. The crowd could be seen making the most of the time, whistling, yelling and having a blast, not letting the winter chill dampen their night. The event also supported Swacch Bharat campaign which was launched by Prime Minister Narendra Modi on Gandhi Jayanthi last year. To add to the extravaganza, the production backed by state of the art technology. The stage had a video montage of Rahman's career highlights that played out his highlightingA moments in the industry so far. The night ended with the track "Jai Ho" which also won him an Oscar in 2009. Saugato Bhowmik, Head, Live Viacom18 and Consumer Products, Viacom18, said: "A.R. Rahman Encore was an enriching experience. Each city got to witness the magical streak of the maestro's performance. As we closed the last leg of the tour in Delhi, it was overwhelming to see thousands of music lovers come together to witness this living legend." Kunal Khambhati, Head- Live Events and IP, BookMyShow said: "When A.R. Rahman takes the stage, one cannot expect anything less than pure musical delight and this is exactly what New Delhi witnessed tonight." The promoter of the tour, Madhuvanthi Arun of Maha Enterprises said: "Today, we have created history by bringing the A.R. Rahman concert to New Delhi, and would like to thank the relentless and unwavering support and faith that has been entrusted to us.